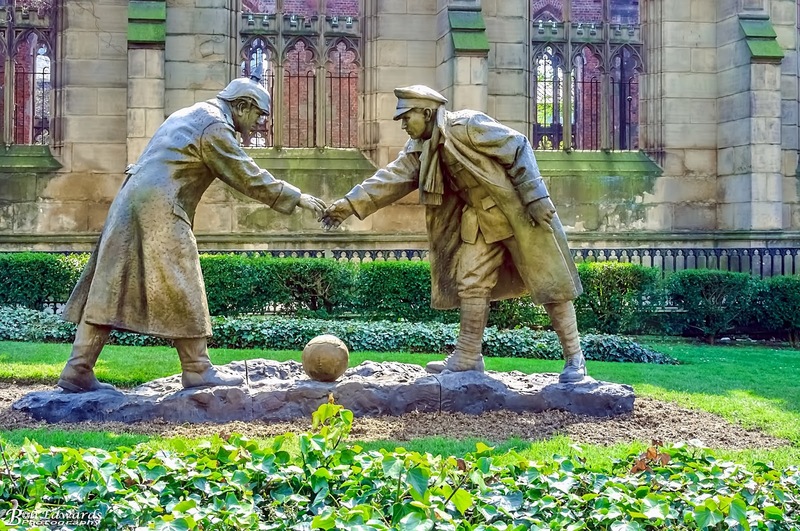 A sculpture commemorating the World War One Christmas truce made up of two fibreglass figures, about to shake hands. It captures the moment British and German soldiers stopped fighting and played football on Christmas Day 1914. Named All Together Now, the statue was designed by sculptor Andy Edwards. St Luke's Church, which faces down Bold Street, is itself a monument to the 1941 Blitz on Liverpool. The building was almost destroyed by an incendiary bomb in May 1941 and has remained as a burnt-out shell ever since.